Uber is the official rideshare partner of the Capital One Arena, DC's premier sports and entertainment arena and home to the Washington Capitals and Washington Wizards. Whether you're going to watch your favorite team or artist, we've got your ride. Once you exit the arena, open the Uber app, enter your destination, and slide the selector to your desired vehicle option. There are many to choose from with a variety of price points. You'll be prompted by the app to choose which designated Uber pickup zone you are at. Select the cross streets and confirm your pickup location. 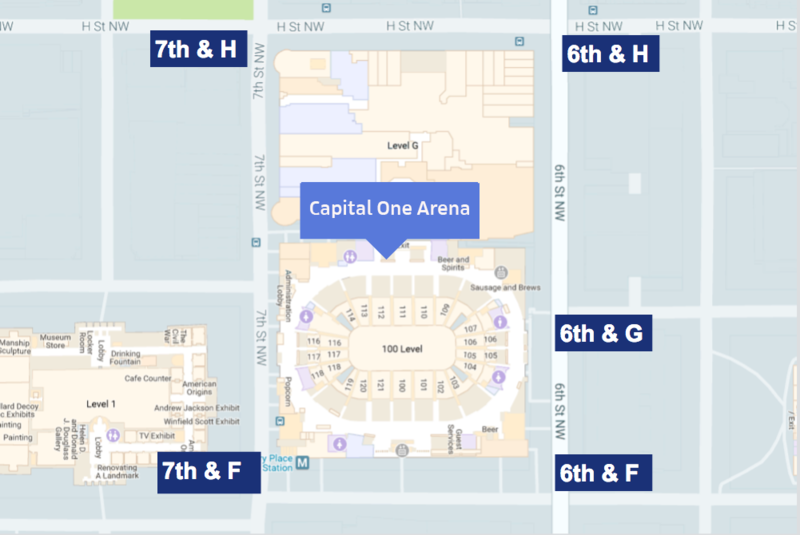 The area surrounding the Capital One Arena may be crowded after an event, so use your app to call or text your driver if you’re having trouble connecting. Make sure you’re getting into the right car by confirming the driver’s name and license plate number. Located in the heart of Chinatown, Capital One Arena hosts over 200 events per year. Take a look at what is coming soon. US only. Valid on first ride up to $15 USD. Not valid on uberTAXI and expires 6/30/2019.